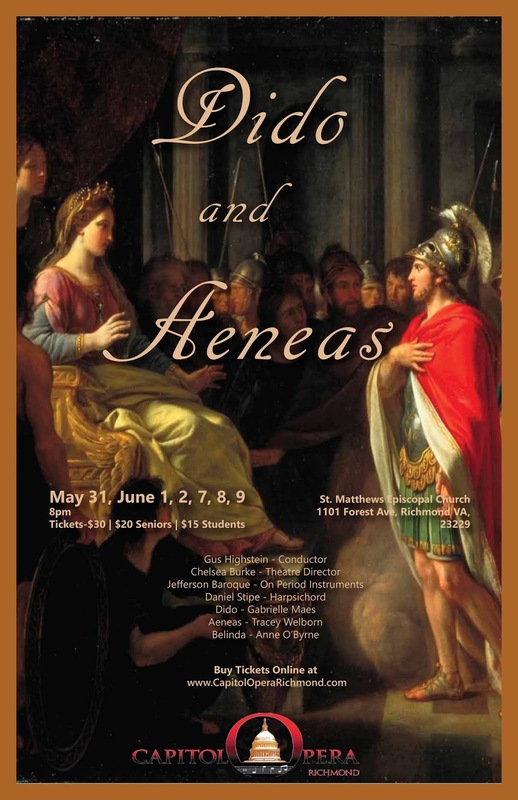 Gabrielle Maes will be performing as Dido in Captial Opera's Dido and Aeneas in a limited engagement with Captial Opera Richmond! Tickets to performances can be purchased here! Dido and Aeneas is the only genuine opera by Henry Purcell (1659-1695) and is one of the earliest English operas. (“Genuine” in the sense that it is made up mostly of sung music rather than spoken word or dance interspersed with songs.) It was probably composed in 1688 for a performance at “Mr. Josiah Priest’s boarding-school at Chelsea by young gentlewomen.” See notes in the Bartlett edition’s introduction on the musical sources and theories of the work’s origin. The libretto, by Nahum Tate, is based closely on Book 4 of Vergil’s Aeneid. Tate’s main departure from Vergil’s epic was to add witches as agents of destiny. As in Vergil, the heroine is sometimes called Dido and sometimes Elissa or Eliza. In its musical style, the opera is very eclectic. It combines innovations from contemporary French and Italian operatic practice (a Lully-style overture, recitatives, laments over a ground bass), English country dances and Scottish rhythms, and even features from old-fashioned madrigals (the witches’ “ho-ho-ho”s are like fa-la-la’s in madrigals).